We in the National Democratic Front-Eastern Visayas (NDF-EV) greet all patriotic Filipinos who celebrate today, September 28, the 116th anniversary of the victorious armed people’s uprising against US imperialist occupation troops in Balangiga, Eastern Samar in 1901. For many years, the townsfolk of Balangiga have insisted on reenacting the uprising their revolutionary ancestors fought and won, where the climactic scene is casting down of the US flag even though it is officially frowned upon. We salute the brave people of Balangiga and their supporters today in Tacloban and elsewhere for their militant tradition of keeping Filipino revolutionary history alive. 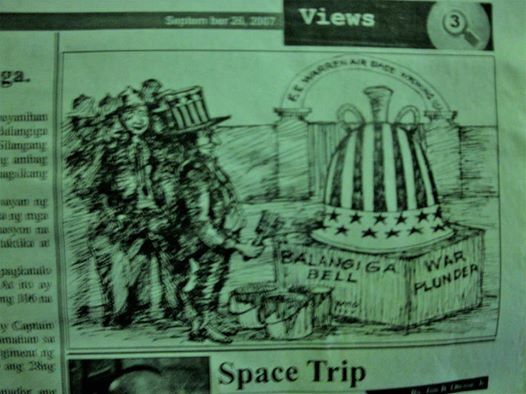 We support their continuing anti-imperialist struggle for justice and redress including the return of the Balangiga church bells US troops took as war booty. It is important to stress the revolutionary and anti-imperialist impact of the Balangiga Uprising in light of attempts by US imperialism and the ruling classes to appropriate and use it to peddle the exact opposites of surrender and puppetry. This was outlined in the state of the nation address of puppet president Rodrigo Duterte who demanded the return of the Balangiga bells as well as in the response of glib support by the US embassy. Duterte’s pseudo-patriotism has been exposed as he allows US military intervention in the wholesale destruction of Marawi City and war against the Moro people, while the US backs martial law in Mindanao and the counterinsurgency program Oplan Kapayapaan that is causing massive human rights violations against the peasants and national minorities in the countryside. Duterte is also pseudo-patriotic in brutally extolling the thousands of extrajudicial killings in the anti-drug war just over a year after assuming power against the faint condemnation of the US to make him toe the line. The Balangiga Uprising on Sept. 28, 1901, provided the prototype for armed mass uprisings in the context of people’s war, though despite the courage and sacrifice, the old Philippine Revolution was bound to fail because it was of the old type. But the new democratic revolution under working class leadership and with a socialist perspective will surely persevere with the lessons from history. The oppressive and widely despised AFP troops are surrounded by masses of the seething poor peasants in the countryside. As the New People’s Army strives for full-scale guerrilla warfare in the next few years towards achieving a strategic stalemate, the conditions for Balangiga-type armed mass uprisings will become more and more feasible. Let us, therefore, remember the heroism of the past Filipino patriots who struggled against US imperialism. There is no better way of honoring them than to win over the masses in their millions to the Philippine revolution, raise the people’s war to a new and higher level, fight in a thousand Balangiga uprisings and attain national and social liberation!